Trump FCC Chairman Ajit Pai -- a former Verizon exec -- says that we can count on ISPs to voluntarily refrain from abusing their natural monopolies to degrade service to their customers in order to maximize their profits. But Pai's FCC also wants to be sure that companies like Verizon face no competition when they provide internet access, banning cities from creating municipal networks, even in places where no ISP is willing to provide internet access. In this regard, Pai's FCC is carrying on the work of the GW Bush years, which killed the pro-competitive practice of requiring incumbent phone companies to lease their equipment to new entrants to the market, who could discipline these old companies by offering competition. The result of years of Republican opposition of telcoms competition means that most Americans only have one or two options for broadband. What's more, lax anti-competition enforcement opened the door to those ISPs merging and abusing their power, repeatedly breaching net neutrality rules and degrading their customers' connections to the internet in order to solicit bribes from internet companies to be "protected" from this discriminatory treatment. 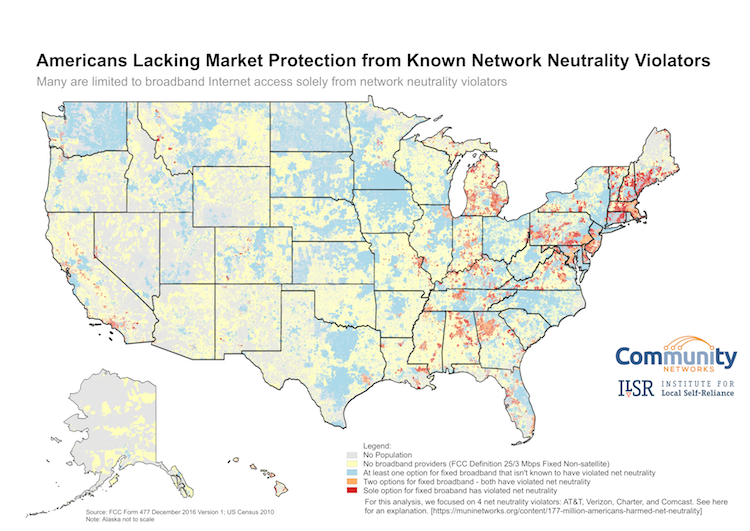 A new report from the Institute for Local Self-Reliance reveals the full scale of the problem: of the 129,000,000 Americans served by a single ISP, 50,000,000 have to rely on monopolist providers that have been convicted of breaching Net Neutrality. Another 50,000,000 Americans are served by only two ISPs, and all of those duopolists have also been convicted of breaching net neutrality. For our analysis, we focused on the two biggest cable and telephone monopolies: AT&T, Verizon, Charter, and Comcast. These firms have multiple violations of both the letter and spirit of the rules around network neutrality and have spent millions to prevent the FCC from enforcing the rules.